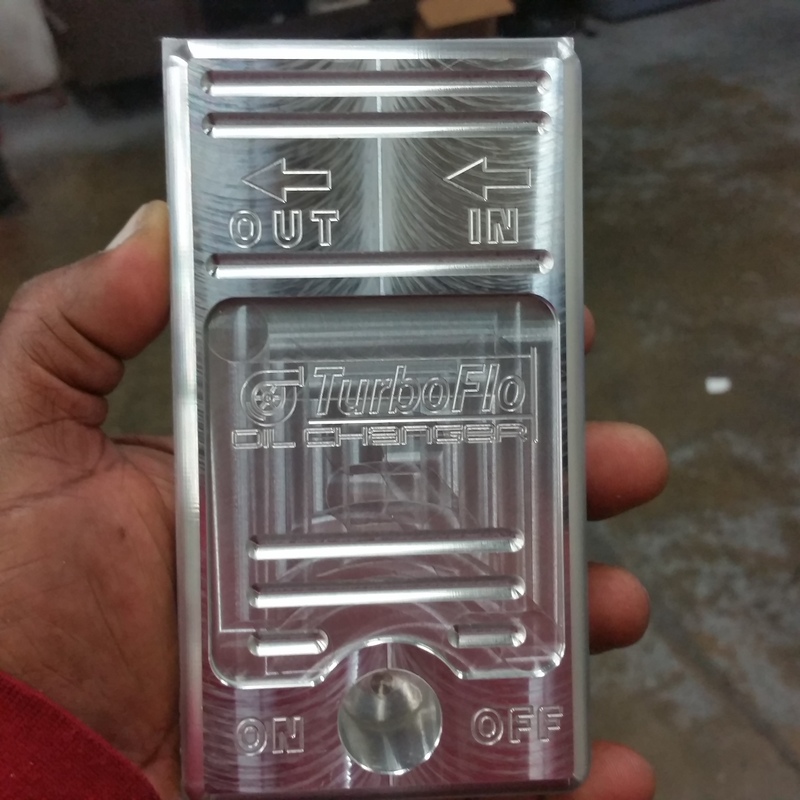 The TurboFlo Oil Changers are being machined this week. We will start anodizing the parts next week. The will be available on amazon.com very soon. For cars that have an oil dipstick, I have been thinking about designing an oil changer pump that will be like nothing else on the planet and will have the following features: 1. Of course you will not have to jack up the car as the oil will be extracted through dipstick hole. 2. Unlike other extractors on the market , this unit will not require a. An air compressor to operate b. Manual pumping to create suction c. The user to dump the oil, it is pumped directly into the recycle container 3. This unit is very small and easy to handle 4. Made in USA of machined aluminum NOT plastic 5. Can extract warm oil in 2-5 minutes depending on vehicle capacity 6. Does not require a battery, operates on your car’s 12 volt battery 7. Costs less than some people pay for an oil change 8. Anyone can easily use it from teens to non-mechanical persons to the elderly 9. Allows you to change your oil without jacking up your car in as little as 5 minutes. 10. Looks Awesome I billet aluminum or anodized blue Would you be interested in such a device? If enough people are interested I will engineer one like nothing currently in existence. Let me know. Here is a sneak preview of what we are designing for the Aluminum version "Light Saver 2" we are working on the tooling and molds and they should be available in 90-days if all goes well as planned. Take a look. The words "Light Saver" on the current version will be replaced with the initials "LS" as you will see and the letters will be offered in the color of your choice. Light Savers are now available and have been now for about a week. They can be purchased from our website - www.ycccdiy.com They are also on eBay for the same price just search for "Porsche Light Savers" You may also send a payment directly to our PayPal e-mail at: Porschetaillight@gmail.com We did have a special for $29.95 which many have been asking about. That special has ended but we may run another special around Christmas. The current price is $79.95 for a set of 2 not each. I am working very hard on getting the aluminum powder coated version up and available but for now we only have the automotive thermal impact plastic version. The aluminum version will be $124.95 and will also be on our website and on eBay and via direct PayPal as well. I will post another video for the aluminum version as well. Here is a link for installation of the polymer version. We strongly recommend that you watch the video before attempting to install your Light Savers and close the engine compartment lid slowly at first while checking for clearance! Light savers are available on eBay, on our website www.ycccdiy.com or by messaging me here on the forum. check out the YouTube video to see how they are installed and how they look on the car. Do you still want seal gray? I strongly recommend against it and suggest you watch the YouTube Video first before choosing seal gray. I can make them, but you probably won't like the way they look when you get them. I would go with black like the OEM mount flange. But if you ultimately decide you want gray, red, yellow, blue etc. I can make them, just let me know.